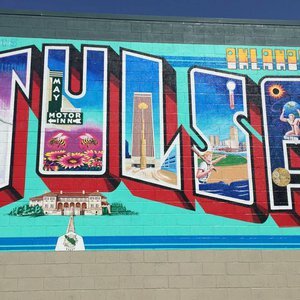 Since completing his popular “This Land” mural on the silos of the former Rocktown Climbing Gym, Oklahoma artist Rick Sinnett has toured across the state, adding murals across Route 66. In 2015, Sinnett stopped in Norman to add a red tail hawk mural to the Financial Center, which once housed the Vista Sports Grill. 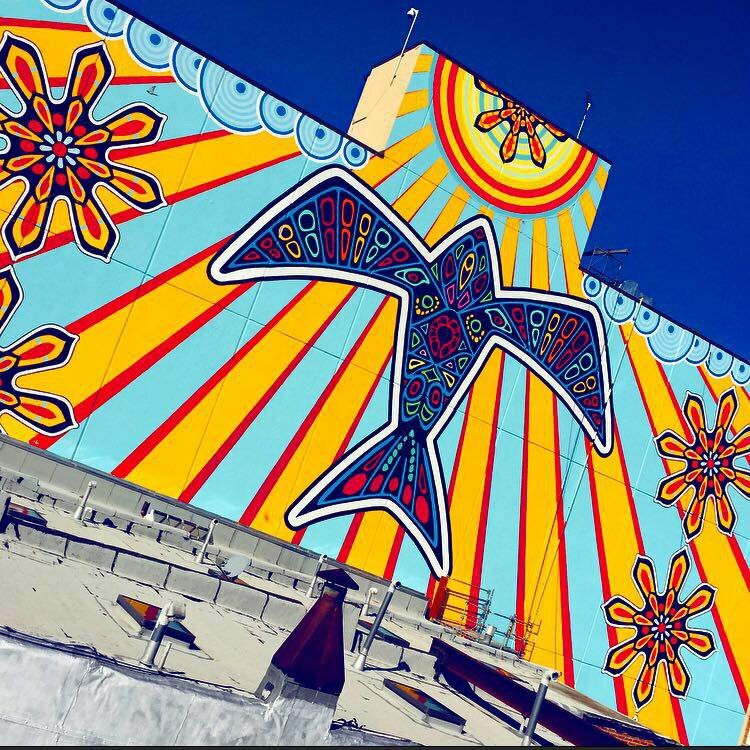 Sinnett painted intense colors and Oklahoma symbols on this six-story building after asking the building owner Jim Adair for permission to create on this immense blank slate. After receiving Adair’s seal of approval, Sinnett brought one of his red hawk sketches to life in conjunction with Norman Arts Council. The mural painting process took months of planning, from creating a giant hand-cut stencil to outlining the design in Sharpie. Once the outline was complete, Sinnett could start rolling bright paints onto the giant canvas, filling in the blank spaces with vivid geometric designs, including the central red hawk and Oklahoma wildflowers. Take I-35 S to US-77 S/N Flood Ave in Norman. Take exit 113 from I-35 S. Take Flood Ave 4.8 mi. to E Main St.